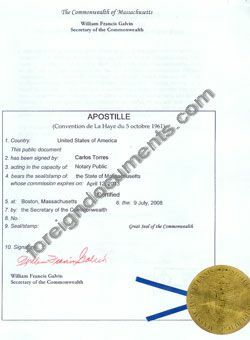 Documents notarized by a currently commissioned Massachusetts Notary Public and authenticated by relevant Massachusetts County Clerk or authorized Deputy County Clerk. Certified copies of Birth Certificates, Death Certificates or Marriage Certificates issued by Massachusetts vital Records Office and authenticated by relevant County Clerk or authorized Deputy County Clerk. Certified copies of corporate documents: Articles of Incorporation, Articles of Amendment, Articles of Merger, Articles of Dissolution, Certificate of Status issued by Massachusetts Secretary of State.